Nearly one week after Britain's royal wedding, the debate still wages on over whether or not Meghan Markle's dress was a dramatic entrance into the royal family or a demure disappointment. The former actress (36) wed Prince Harry at Windsor Castle in front of 600 guests with millions watching around the world and her arrival onto the steps of St George's Chapel in a dramatic Givenchy gown was met with either a discerning look or applause of approval. 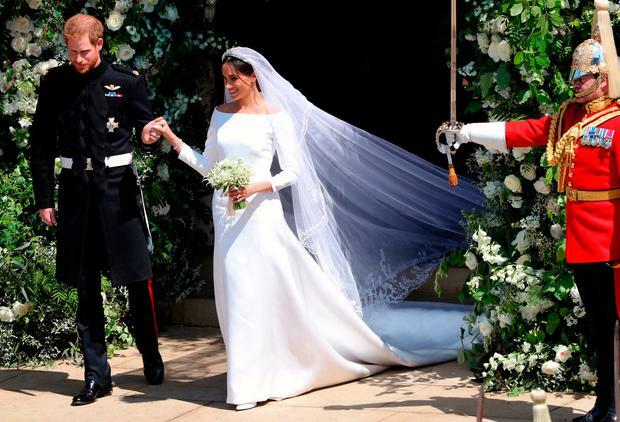 Katy Perry said earlier this week that she should have had "one more fitting", but fashion designer and royal wedding guest Victoria Beckham only had praise for the new Duchess of Sussex, saying she "looked absolutely beautiful". "It really suited her. I thought it was perfect for her. And Harry looked great," she told the Evening Standard. Beckham - who attended with husband of 20 years David, whose appearance may have earned just as much column inches as the bride and groom - praised Harry and Meghan's romance and spoke of her gratitude at being included in the big day. "It was just the best day. They looked so happy, and everybody was just so happy for them. Meghan seems like a genuinely lovely woman, who really loves him. It felt very real, very honest," she said. When asked about her choice of outfit, a navy blue dress from her eponymous line and an matching fascinator with embellished netting, she said this time around she was just relieved to have more non-maternity options. "Quite honestly, it was such a relief not to be hugely pregnant at this royal wedding that it was a joy to be able to choose anything I wanted to wear," she said. "I love a bit of navy. The dress is one of my favourites: it isn’t in store until November, but we’ve had so many inquiries about it that I’m seeing whether I can bring it forward."